Sanbot is a humanoid robot that is capable of a variety of functions. Sanbot is available for sale and for hire. We are the UK Distributor for Sanbot Elf, Sanbot Nano and Sanbot King Kong. 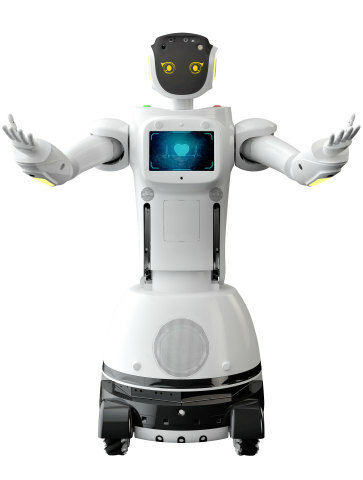 Sanbot is available for sale and for hire throughout the UK and Ireland. Sanbot is the perfect blend of human and machine with a beautiful ergonomic design fitted with the latest robot technology. Sanbot has over 60 sensors to give perfect awareness of its surroundings, complete with obstacle detectors. and comes with a laser projector fitted in its head. Sanbot has animated arms with 250 colors to choose from that move to the beat of any music. Sanbot has 12 wheels to enable perfect movement as well as 360 degree spot rotation. Sanbot also features voice recognition and will respond to commands. Sanbot features facial recognition as well as integrated telepresence. If you would like to see the full Sanbot Elf user manual, please click here. Sanbot is available for sale and for hire. Sanbot is an intelligent service (humanoid) robot developed by QIHAN Technology, a company focused on innovations in robotics, artificial intelligence, and video analysis. Resulting from years of research and development, the new Sanbot platform will unleash the power of cloud-enabled robotics and AI for retail, hospitality, healthcare, education, security and many other customer-oriented indus- tries to deliver smarter, more personalized services. As a catalyst in service innovations and business productivity, Sanbot is taking robotics technology mainstream. With an open API that enables developers to build Android applica- tions that harness Sanbot’s powerful AI and machine-learning capabilities, businesses will deliv- er richer, smarter and more interactive services that increase customer satisfaction and loyalty. Sanbot is designed to integrate seamlessly with Q-Link, a proprietary mobile application that enables real-time communications, and also serves as a powerful console that enables users to control and access Sanbot’s data and functionalities. Q-Link offers an open development platform through which users can control Sanbot and add functionality. Additionally, users can take direct control of Sanbot, guiding the robot using manual controls or using Sanbot’s built-in au- dio-visual features and HD cameras. From customizing user preferences to storing media les to adding retailer-speci c data, the Q-Link Cloud System allows each user to customize and personalise their interactions with Sanbot. Sanbot is equipped with advanced input sensors that allow it to understand and communicate with the world. The body is designed to detect obstacles, human beings, and other objects, making it a nimble and unobtrusive addition to any commercial space. Sanbot’s head can sense human beings, read gestures and facial expressions, and respond to complex voice commands. Sanbot’s chassis sports a 10.1 inch 1080P touch screen display which can be used to enter commands or view high-de nition content. It also includes a built-in projector that projects a bright 1920 x 720 HD picture in a 16:9 aspect ratio. It also includes two cameras, including an 8 MP HD camera, which can capture footage and give users a look at what Sanbot sees. Sanbot is connected – featuring 802.11 a/b/g/n Wi-Fi standards on both 2GHz and 5GHz wavelengths. It also features Bluetooth 4.0 and ZigBee connectivity, enabling Sanbot to truly be the hub of your connected ecosystem. Additionally, Sanbot is powered by a 20Ah/300W lithium battery that can keep it running at full load for four hours and in standby mode for ten. When Sanbot needs to charge, it’s able to nd its charging station on its own, making power management concerns an afterthought. For businesses looking to stand out from their competition, Sanbot provides a unique way to engage customers and deliver better service. Sanbot o ers a versatile, intelligent, and fun experience that elevates simple activities such as going to dinner, visiting a tourist destination, going shopping and more. And for industries like healthcare and education, Sanbot can be a helpful assistant due to its intuitive, smart voice recognition technologies and mobility. Sanbot’s cloud-enabled connected ecosystem—managed through the robust Q-Link mobile app—can help commercial and service industries learn about customer behavior and preferences. This allows for better, more personalized service. Sanbot’s servers are built with advanced en- cryption features designed to protect user information. Since Sanbot is mobile, it can be a guide for new visitors at large retail spaces. It’s able to communicate via video and audio, and can be an attention-getting marketing platform. And because it’s smart, it can provide customer service experiences that satisfy and entertain. Sanbot is an excellent addition to a workforce and can help increase e ciency and cost-savings in a way that complements human workers. For example, in a healthcare setting, Sanbot can be a friendly, reassuring presence available at any hour of the day. In a retail setting, Sanbot can be an always-on marketing ambassador that helps drive tra c and presents a unique way to share information on sales, deals and more. Additionally, Sanbot can help keep your business safe, with high-de nition cameras, motion sensors and the ability to maintain patrol routes, Sanbot can be a vigilant observer that protects your business and your customers.